Even though the small packet card trick goes at least back to Hofzinser's times Jon argues that the modern small packet trick started in the 1940s when the Buckle Count was introduced by Dai Vernon and got into full swing when the Ghost Count (Elmsley Count) entered the stage. When the Elmsley Count became more widely known, the genie was out of the bottle. Vernon’s “Twisting The Aces” provided momentum. Marlo’s groundbreaking work on “Think Ace” and “Touch Turn” was privately circulating and then was eventually published in The Linking Ring. By the time Larry West and Verne Chesbro published Tricks You Can Count On, all hell broke loose. 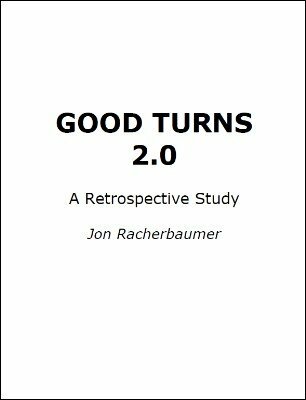 Jon Racherbaumer collects here a large variation on 'twistin and turning' effects. 1st edition 1977; 2nd edition 2002; 56 pages. This is a good overview of magic's "twisting" craze. Descriptions are good but bare bones, though Jon does describe what I think is an improved version of the Elmsley Count in the context of Vernon's original routine. You should know that a few illustratons are missing from this version, but this did not cause me any trouble. I think it is a good buy at $10.